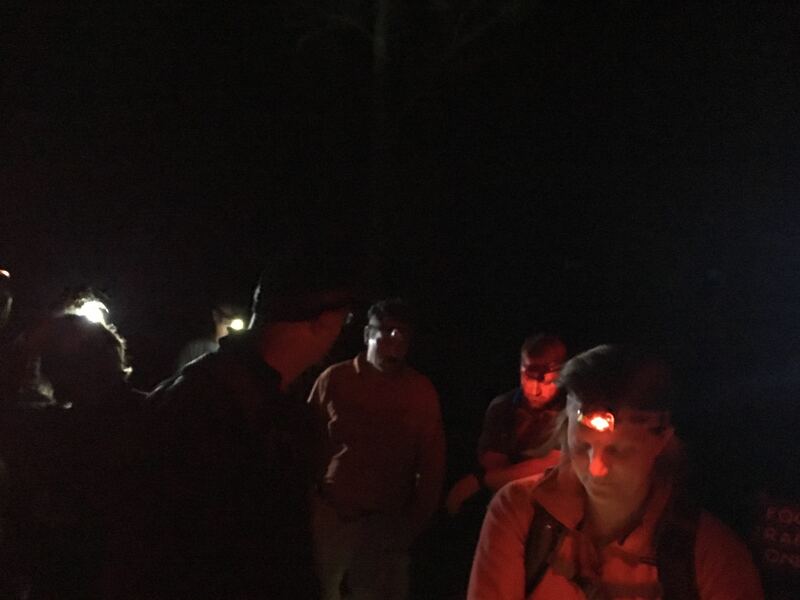 Goodbye Daylight Saving Time, Hello Night Hike - GetGoing NC! It’s happening, people! Starting this Sunday, that dwindling daylight will sharply ratchet back an hour. So, while you might be able to sneak in a quick hike after work this evening before the sun sets at 6:19 p.m., next week you’ll be hard pressed to hike before the 5:12 p.m. sunset. Hiking at night offers some special rewards not found during the day. This type of hiking calls for different levels of concentration, as you focus on a close world circumscribed by an orb of light as you scan for footing; this problem-solving aspect of hiking is one of the things that improves not only body but also mind. You can tune in to the sounds of night life, which is not the same as the sounds of daytime critters (more owls than warblers, more raccoons than squirrels). And if you pause and look up, you can see the glories of the night sky (pausing is key; we have tried to hike while looking up at the stars and it ended badly). It’s a special place, the night world, and it is one well worth exploring. We get that night hiking isn’t for everyone. If you’re hopelessly scared of the dark or have very poor night vision, for instance, you might want to pass. But for the rest of you open to the concept, we have some tips for you. A headlamp. This is a must. Flashlights, work, sure, but you really want to keep your hands free. You can get a decent one for as little as $15; note that LEDs cast a more hike-friendly light. Be sure to pack both extra batteries and a spare light (a little pen light will do, so you can see to change out your batteries). Pick short hikes to start. Night hiking takes some getting used to. Your world is confined to the glow of your headlamp, and it takes some concentration to focus on such a limited portion of the trail. Surprisingly, it can be a sensory overload, as your other senses tune in to the world beyond the scope of your light. So don’t overstay on your first outing. Hike trails you’ve hiked in daylight. Even though it’s dark, familiarity is a huge plus. You’ll be amazed at how things you didn’t think you noticed during the day will pop out as key markers of where you are on the trail. Hike by your feet. It takes a bit more effort to scout out the blazes at night rather than in the day. The best way to tell whether you’ve wandered off the beaten path is if your boots are suddenly sinking into soft, untrodden leaf litter. Backtrack and seek out firm footing. Bundle up. Nighttime is cooler than day, of course. Counter the chill with one more layer than you think you’ll need; you can always shed a layer later. Don’t hike alone. I do a lot of soloing, but not at night. Again, take extra batteries. If your light goes out, you’re really in the dark. Take a map and compass. * You should already have these in your daypack, but make extra sure you have them at night. Take water and snacks. Just because it’s dark doesn’t mean you can’t get dehydrated. And hiking in the cool air while concentrating on the trail will burn some calories; you’ll be glad to have the extra fuel. Appreciate the night sky. Because that’s one reason you’re hiking at night! Take a cell phone, just in case. Besides, most phones have a flashlight function that could save you in a pinch. Note that most trails on public lands are closed from dusk until dawn. That includes state parks and nearly all municipal and county trails. National forests typically don’t have hours, nor do lands managed by the N.C. Wildlife Resources Commission. Intrigued, but maybe a bit uncertain about trying on your own night hike for the first time? In the Triangle area, our GetHiking! chapter holds night hikes, in conjunction with Hike NC, the Blue Cross and Blue Shield of North Carolina-sponsored hiking program, every Wednesday at 6 p.m.. You can learn more here. Of course, a map and compass will get you only so far if you don’t know how to use them. If you need some direction, check out our GetOriented! classes. The next one is Sunday, Nov. 12. Go here for details and to sign up.